Ceramic containers can really add a calming and organic effect into a decorative scene. They can be the right touch to bring a room together. Using vases, trays, and bowls allow a lot of versatility. Vases can be used as a creative way to hold utensils in a kitchen and bowls can be used for small plants. 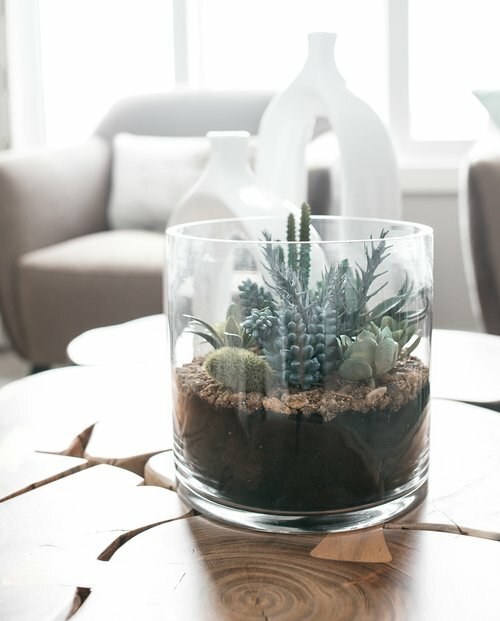 The right container, paired with the right filler, can set the scene and create a warm and inviting space. Having lifestyle elements in your home can really set the pace for the theme you want to incorporate. Lifestyle elements are things that breathe life into any room, and prevent it from feeling too staged. These can be things such as a bowl of fruit on a dining room table, little figurines on nightstands, books on a coffee table, etc. You can even add a breakfast tray on a set bed. Use lifestyle scenery sparingly so it doesn't come off too cheesy and over-done.